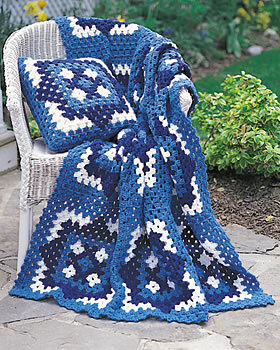 Use this free crochet afghan pattern from Bernat Yarns to create a lovely block afghan in coordinating blues and white. Twelve motifs are joined to create the complete afghan. This is an editorial team favorite of our large hook crocheted afghan patterns. This is a great pattern for beginners and those looking for a fun afghan to make for themselves or a friend. Mix and match colors to create an afghan that's perfect for your home. This crochet afghan make a fantastic crochet pattern for beginners because, while the design looks relatively intricate, the stitches used are relatively easy. Plus, this afghan pattern will afford any newbie a chance to shine while they hook up their first big and beautiful project. If you are brand new to crochet, explore our list of beginner crochet project ideas. There's no better way to learn how to crochet than exploring new patterns and learning along the way. 50+ Free Easy Crochet Patterns + Help for Beginners is the go-to spot for crochet newbies. Gauge: One Motif = 16 ins 41 cm square. Note: When working separate sections of colors within one rnd, wind small balls of the colors to be used, one for each separate area of color in the rnd. Start new colors at appropriate points as indicated throughout pattern instructions. With MC, ch 5. Join with ss to form ring. 1st rnd: Ch 3. 2 dc in ring. (Ch 2. 3 dc in ring) 3 times. Ch 2. Ss in top of ch 3. Fasten off. 2nd rnd: Join A in any ch 2 sp. (Ch 3. 2 dc. Ch 2. 3 dc) in same sp. Ch 1. *(3 dc. Ch 2. 3 dc) in next ch 2 sp. Ch 1. Rep from * twice more. Ss to top of ch 3. 3rd rnd: Ch 3. *Join B. Ch 1. (3 dc. Ch 2. 3 dc) in next ch 2 sp. Join A. Ch 1. ** 3 dc in next ch 1 sp. Rep from * twice more, then from * to ** once. 2 dc in same ch 1 sp as first ch 3. Ss to top of ch 3. Turn. 4th rnd: (WS). With A, ch 3. 2 dc in same sp. Ch 1. 3 dc in next ch 1 sp. *With C, ch 1. (3 dc. Ch 2. 3 dc) in next ch 2 sp. ** With A, (Ch 1. 3 dc in next ch 1 sp) twice. Rep from * twice more, then from * to ** once. Ch 1. Ss to top of ch 3. Fasten off all ends. Turn. 5th rnd: (RS). Join MC to any corner ch 2 sp. (Ch 3. 2 dc. Ch 2. 3 dc) in same sp. *(Ch 1. 3 dc in next ch 1 sp) 3 times. Ch 1. ** (3 dc. Ch 2. 3 dc) in next ch 2 sp. Rep from * twice more, then from * to ** once. Sl st to top of ch 3. Turn. 6th rnd: (WS). Ch 3. 2 dc in first ch 1 sp. *(Ch 1. 3 dc in next ch 1 sp) 3 times. Ch 1. (3 dc. Ch 2. 3 dc) in next ch 2 sp. Ch 1. ** 3 dc in next ch 1 sp. Rep from * twice more, then from * to ** once. sl st to top of ch 3. Fasten off. Turn. 7th rnd: (RS). Join A to any corner ch 2 sp. (Ch 3. 2 dc. Ch 2. 3 dc) in same sp. *(Ch 1. 3 dc in next ch 1 sp) 5 times. Ch 1. ** (3 dc. Ch 2. 3 dc) in next ch 2 sp. Rep from * twice more, then from * to ** once. Sl st to top of ch 3. Turn. 8th rnd: (WS). Ch 3. 2 dc in first ch 1 sp. *(Ch 1. 3 dc in next ch 1 sp) 5 times. Ch 1. (3 dc. Ch 2. 3 dc) in next ch 2 sp. Ch 1. ** 3 dc in next ch 1 sp. Rep from * twice more, then from * to ** once. Ss to top of ch 3. Fasten off. Turn. 9th rnd: (RS). Join B to 6th ch 1 sp from any corner ch 2 sp. (Ch 3. 2 dc) in same sp. Ch 1. 3 dc in next ch 1 sp. Ch 1. (3 dc. Ch 2. 3 dc) in next ch 2 sp. (Ch 1. 3 dc in next ch 1 sp) twice. *Join A. (Ch 1. 3 dc in next ch 1 sp) 3 times. ** Join B. (Ch 1. 3 dc in next ch 1 sp) twice. Ch 1. (3 dc. Ch 2. 3 dc) in next corner ch 2 sp. (Ch 1. 3 dc in next ch 1 sp) twice. Rep from * twice more, then from * to ** once. Ch 1. Sl st to top of ch 3. Turn. 10th rnd: (WS). With A, ch 1. Ss in each of next 3 dc. Sl st in next ch 1 sp. Ch 3. 2 dc in same sp. Ch 1. 3 dc in next ch 1 sp. *With B, (Ch 1. 3 dc in next ch 1 sp) 3 times. Ch 1. (3 dc. Ch 2. 3 dc) in next ch 2 sp. (Ch 1. 3 dc in next ch 1 sp) 3 times. ** Join A. (Ch 1. 3 dc in next ch 1 sp) twice. Rep from * twice more, then from * to ** once. Ch 1. Ss to top of ch 3. Fasten off B sections. Turn. 11th rnd: (RS). Join MC to 6th ch 1 sp from any corner ch 2 sp. (Ch 3. 2 dc) in same sp. (Ch 1. 3 dc in next ch 1 sp) 3 times. Ch 1. (3 dc. Ch 2. 3 dc) in next ch 2 sp. (Ch 1. 3 dc in next ch 1 sp) 4 times. *With A, ch 1. 3 dc in next ch 1 sp. ** Join MC, (Ch 1. 3 dc in next ch 1 sp) 4 times. Ch 1. (3 dc. Ch 2. 3 dc) in next ch 2 sp. (Ch 1. 3 dc in next ch 1 sp) 4 times. Rep from * twice more, then from * to ** once. Ch 1. Sl st to top of ch 3. Fasten off A sections. Turn. 12th rnd: (WS). With last MC end, sl st in ch 1 sp. Ch 4. (3 dc in next ch 1 sp. Ch 1) 4 times. *(3 dc. Ch 2. 3 dc) in next ch 2 sp. ** (Ch 1. 3 dc in next ch 1 sp) 10 times. Ch 1. Rep from * twice more, then from * to ** once. (Ch 1. 3 dc in next ch 1 sp) 5 times. Ch 1. 2 dc in same ch 1 sp as first ch 4. Sl st to 3rd ch of ch 4. Turn. 13th rnd: (RS). Sl st in each of next 2 dc. Ss in next ch 1 sp. (Ch 3. 2 dc) in same sp. [(Ch 1. 3 dc) in next ch 1 sp] 5 times. Ch 1. *(3 dc. Ch 2. 3 dc) in next ch 2 sp. ** (Ch 1. 3 dc in next ch 1 sp) 11 times. Ch 1. Rep from * twice more, then from * to ** once. (Ch 1. 3 dc in next ch 1 sp) 5 times. Ch 1. Ss to top of ch 3. Fasten off. Joining Two Motifs: With RS facing each other position sides of Motifs tog. Join MC through corresponding corner ch 2 sps. Ch 1. 1 sc in same sp. (Ch 3. 1 sc through next corresponding ch 1 sps) 12 times. Ch 3. 1 sc through next corresponding corner ch 2 sps. Fasten off. Joining Strips of Motifs: With RS facing each other position sides of Motifs tog. Join MC through corresponding corner ch 2 sps. Ch 1. 1 sc in same sp. (Ch 3. 1 sc through next corresponding ch 1 sps) 12 times. ** (Ch 3. 1 sc through next corresponding corner ch 2 sps) twice. Rep from * twice more, then from * to ** once. Ch 3. 1 sc through next corresponding corner ch 2 sps. Fasten off. Edging: With RS facing, join MC to top right corner ch 2 sp. Ch 1. [(1 sc. Ch 4. 1 sc) twice] in same sp. *[1 sc in center dc of next 3 dc. (1 sc. Ch 4. 1 sc) in next ch 1 sp] 12 times. 1 sc in center dc of next 3 dc. [(1 sc. Ch 4. 1 sc) in next corner ch 2 sp] twice. * Rep from * to * once. [1 sc in center dc of next 3 dc. (1 sc. Ch 4. 1 sc) in next ch 1 sp] 12 times. 1 sc in center dc of next 3 dc. [(1 sc. Ch 4. 1 sc) twice] in next corner ch 2 sp. Rep from * to * 3 times. [1 sc in center dc of next 3 dc. (1 sc. Ch 4. 1 sc) in next ch 1 sp] 12 times. 1 sc in center dc of next 3 dc. [(1 sc. Ch 4. 1 sc) twice] in next corner ch 2 sp. Rep from * to * twice. [1 sc in center dc of next 3 dc. (1 sc. Ch 4. 1 sc) in next ch 1 sp] 12 times. 1 sc in center dc of next 3 dc. [(1 sc. Ch 4. 1 sc) twice] in next corner ch 2 sp. Rep from * to * 3 times. [1 sc in center dc of next 3 dc. (1 sc. Ch 4. 1 sc) in next ch 1 sp] 12 times. 1 sc in center dc of next 3 dc. Ss to first sc. Fasten off. This blue and white crochet afghan looks like a granny square inside a granny square pattern. Blue and white are my favorite color and I need more blue and white like I need another hole in my head but I am adding this to my save patterns and I know I will get to this one after the holiday season. It is difficult to go wrong when making something in the calming blue hue. This blue and white crochet afghan would be great to make for yourself or as for a gift for someone else. This easy project when completed will leave you with a beautiful afghan that you will reach for time and time again. which color is contrast a and which one is contrast b? it doesn't say so how do i know when to use the white and when to use the dark blue? is the white contrast a and the dark blue contrast b? or vise versa? Oh dear, you're not kidding! I looked at a few other resources and they also don't have the colors listed. My guess is MC is the medium blue color, Contrast A is navy, and Contrast B is white. Good luck! What shades of blue were used here? I really like them together, but they are never named. When I first saw this pattern I knew I had to try it. My husbands favorite color is blue, with this pattern being three shades of blue, I knew he would love it. I thought it would be difficult and was nervous when I started, but quickly realized it was not difficult and it turned out beautifully. Thank you for sharing your pattern! hi ,I really love this pattern,but I can't figure out ,how to make this pattern,really love the pattern ,have search about 1 month on the internet .so ,please help me , do you have description ,on paper or video ,a clear picture of the motif pattern please! !thank you yarnsipration.com they dont have a lot of information on this pattern because it is old pattern!! can you mail to me please! Have a question about step 4. Should I fasten off after ch3 of A and before I begin with yarn B? If not what should I be doing? Love this pattern and so want to try doing it but getting stuck. Please HELP! I am stuck on step 4, I was hoping someone could send me a link to explain how to do that step? Also what are the acronyms WS and RS? Thanks! WS is "wrong side" and RS is "right side"
I'm working on this in Aran and two shades of purple. It's looking pretty awesome. I wish the patterns were available in PDF format though. I made this in shades of greys, to match my family room Gorgous!!!! !